Products | Afanche Technologies, Inc.
Afanche Technologies, Inc. proudly presents our product line of 3D visualization tools for dynamic organizations who need the flexibility for an increasingly mobile workforce. Our Viewer products are designed and built for the most popular platforms including: Apple's iOS (iPhone & iPad) and Mac OS, Google's Android (Phone & Tablet), Microsoft's Modern Style User Interface (Tablet / PC) and Windows Laptop & Desktop platform. You can find our products by searching "afanche" or ATVeiw3D at Apple's AppStore, Google's Play Store, Microsoft's Windows Store, Amazon and EBay. You can also purchase our flagship desktop products for Windows and Mac through our website. Afanche 3D Viewer apps provide 3D visualization for many popular 3D formats widely used by almost all popular 3D applications including CATIA, Autodesk Inventor, AutoCAD, Maya, ZBrush, Google SketchUp, 3DS Max, SolidWorks, UG, NX, ProE (PTC Creo, ProEngineer), TurboCAD, SolidEdge, and SpaceClaim. 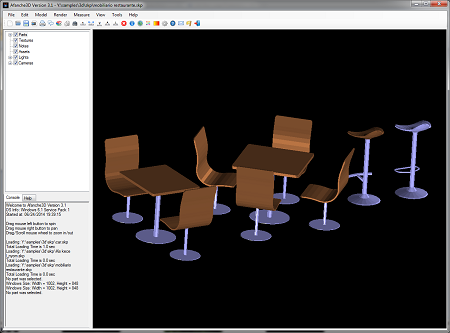 File formats supported include: STL, 3DS, IGES (.igs/.iges), STEP (.stp/.step), X-T/X-B(Parasolid), JT (JT-Open), ACIS (SAT/SAB), WRL (VRML), DAE (Collada), DXF (Autodesk), SKP (SketchUp), Blend (Blender), SHP (ESRI, ArcGIS), 3DM (Rhinoceros), FBX, DWG, BVH, OBJ, TER, SMD, Q3D, Q3S, MDL, MD2, MD3, MD5Mesh, CSM, ASE, B3D, OFF, C3D, AMC, ASF, BVH, AOA, MCD, HTR, TRC, AC, MS3D, PLY, NFF, RAW, ASC, CSV, PCD, NAS, MESH, UNV, APT, G-Code (CNC), and many others. Besides the above formats, we plan to support more 3-D oriented data formats in the near future, including DWG (AutoCAD), DWF (Autodesk), IDW, IPT, IDV, IAM (Autodesk Inventor), DGN (Bentley Systems), CATPart, CATProduct, CATDrawing (Catia V5), SLDDRW, SLDPRT, SLDASM (SolidWorks), PRT, ASM (PTC Pro/ENGINEER), SDP, SDPC, SDA, SDAC, PKG, BDL (PTC CoCreate), PAR, ASM (Siemens Solid Edge), PRT (Unigraphics, UGII), IV (Inventor), U3D, IFC, SLD, CGM, and ZAE. If you need support for any of the formats listed, or if you need 3D viewer support for other formats which are not listed, please feel free to contact us. We will consider your input for future product release. 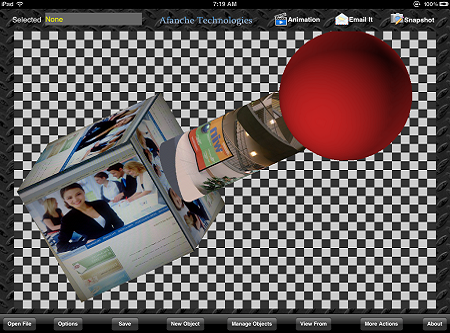 The Afanche3D™ Viewer app is very powerful and super easy to use , there is no learning curve. The app is super fast and is capable of loading very large models. Afanche3D™ visualization apps are widely used by professionals worldwide, including the following industries: CAD, CAM, PLM, 3D Graphics Design, 3D Animation, 3D Art, Medical, Floor Planning, Virtual Reality(VR), Augmented Reality(AR), Civil Engineering, GIS, Machining, Mechanical, Architecture, Urban Planning and many others.